.Messy Side Bun | Instagram Spam. 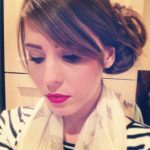 This is a little snap from Instagram i’ve just taken – come follow me @xameliax. Managed to do a messy side bun for the first time this evening with a million bobby pins and i think as long as i don’t move my head at all we should be fine! Has anyone got any techniques for long thick hair to make it stay in place for longer?! I am useless with my hair considering i have so much of it! I hope you’re having a lovely Friday evening everyone – i’m about to film some silly videos with the lovely Beth and her sister which will be appearing on My Youtube channel over the next week or so!